The state of Washington offers both cold water fishing for trout and salmon as well as warm water fishing for bass, walleye, crappie, perch, catfish and more. Choose your favorite type of water as there are terrific lakes, ponds, streams and rivers all across Washington State. Here, you can fish for largemouth bass, smallmouth bass, channel catfish, flathead catfish, blue catfish, white catfish, black crappie, white crappie, walleye, rainbow trout, cutthroat trout, golden trout, brown trout, lake trout, steelhead, bluegill, green sunfish, pumpkinseed sunfish, rock bass, warmouth, yellow perch, Atlantic salmon, coho salmon, chum salmon, chinook salmon, pink salmon, sockeye salmon, northern pike, sturgeon and tiger muskie in local lakes, rivers, ponds and/or streams. This chart shows the major fishing waters in Washington, cross referencing these waters with the major types of fishing to be found in each of the lakes or impoundments. For a more complete list of fish species in Washington, see the list below, which also includes state records. Washington offers excellent fishing year round, enhanced by spectacular views. Fishing lakes, sizes and locations in the state. Alder Lake is a 3,100-acre lake in southwest WA, 40 miles southeast of Olympia. Baker Lake is a 4,800-acre lake in the northwest corner of the state within the Mt. Baker-Snoqualmie National Forest. Banks Lake is a 26,900-acre lake in central Washington, at Coulee City. Cle Elum Lake is a 4,800-acre lake in central Washington, 10 miles northwest of Cle Elum. 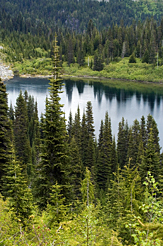 Kachess Lake is a 4,500-acre lake in central Washington, 2 miles north of Easton. Keechelus Lake, aka Lake Keechelus, is a 2,600-acre lake in central Washington, 5 miles southeast of Rockdale. Lake Bryan is a 10,000-acre lake in the east-central part of the state, at Peyton, WA. Lake Chelan is a 33,000-acre lake in the north-central part of the state, at Chelan Falls, WA. Lake Crescent is a 5,100-acre lake in the northwest corner of the state, 15 miles west of Port Angeles, WA. Lake Herbert G West is a 6,000-acre lake in the east-central part of the state, at Perry, WA. Lake Mayfield, aka Mayfield Lake, is a 2,200-acre lake in the southwest corner of the state at Mayfield, WA. Lake Merwin is a 4,000-acre lake in the southwest part of the state, at Ariel, WA. Lake Sacajawea is a 9,000-acre lake in the southeast part of the state, at Walker, WA. Lake Sammamish is a 4,900-acre lake in the west-central part of the state, 5 miles east of Bellevue, WA. Lake Tapps is a 2,400-acre lake in the west-central part of the state, 5 miles east of Puyallup, WA. Lake Umatilla is a 48,000-acre lake running 110 miles along the WA/OR border, mid-state. Lake Wallula (McNary Pool) is a 11,600-acre lake in the southeast part of the state, at Kennewick, WA. Lake Washington is a 22,000-acre lake in northwest Washington, at Seattle. Lake Wenatchee is a 2,500-acre lake in the north-central part of WA, in the Wenatchee National Forest. Lake Whatcom is a 4,900-acre lake in northwest Washington, at Bellingham. Moses Lake is a 6,800-acre lake in the central part of the state, at the town of Moses Lake, WA. Omak Lake is a 3,250-acre lake in the north-central part of the state, at Omak, WA. Osoyoos Lake is a 5,800-acre lake along the US/Canada border near the middle of the state. Ozette Lake is a 7,400-acre lake on the northwest coast of Washington, at Ozette. Palmer Lake is a 2,100-acre lake is located mid-state near the US/Canada border, just south of Nighthawk, WA. Potholes Reservoir is a 27,800-acre lake in central WA, 5 miles south of Moses Lake. Riffe Lake, aka Mossyrock Lake or Davisson Lake, is an 11,800-acre lake in southwest Washington, at Mossyrock. Rimrock Lake is a 2,800-acre lake in the south-central part of the state, at Rimrock, WA. Rock Lake is a 2,200-acre lake in eastern Washington, 10 miles southeast of Sprague. Roosevelt Lake, officially Franklin D. Roosevelt Lake, is a 79,000-acre lake in the northeast part of the state, 60 miles northwest of Spokane, WA. Ross Lake is a 12,000-acre lake on the US/Canada border, in Ross Lake National Recreation Area. Rufus Woods Lake is a 6,400-acre lake, 51 miles long section of the Columbia River in north-central Washington. Silver Lake is a 2,300-acre lake in the southwest part of the state, 5 miles east of Castle Rock, WA. Swift Reservoir is a 4,600-acre lake in the southwest part of the state, at Cougar, WA. Vancouver Lake is a 2,300-acre lake in the southwest corner of the state, on the western outskirts of Vancouver, WA. Yale Lake is a 3,800-acre lake in the southwest part of the state, at Cougar, WA. Visit AA-Boats-Boating.com to find information about fishing boats in Washington state. We are looking for information on local guides who offer services on area waters. You can find a listing of WA fishing guides here. If you are a fishing guide in Washington or know of a good resource, please send us information for consideration. Find regulations and info about local fishing at the Washington Department of Fish and Wildlife website. Click here for a Washington fishing license. Excellent largemouth and smallmouth bass fishing opportunities are available to anglers in WA. Fishing information for each state.